I found this card kit well buried on my desk!!!! Not sure how long ago it was created but that matters not at all because it goes together just as quick!! I stitched the rick rack cardstock die cut to the handmade paper background then stitch all the way around and then glued it to the white card front. I glued the yellow handmade paper circle to the pink flower die cut and then added stitching all the way around. 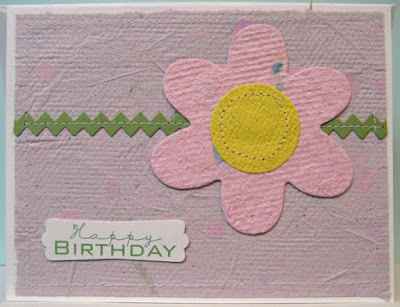 I adhered the flower to the card front over the rick rack border and added the laser printed greeting using 3D foam tape!! Quick and easy!